The challenge with this project was to add a new era-sensitive upstairs bathroom and transform the downstairs double bath in an early 20th century NC farmhouse. 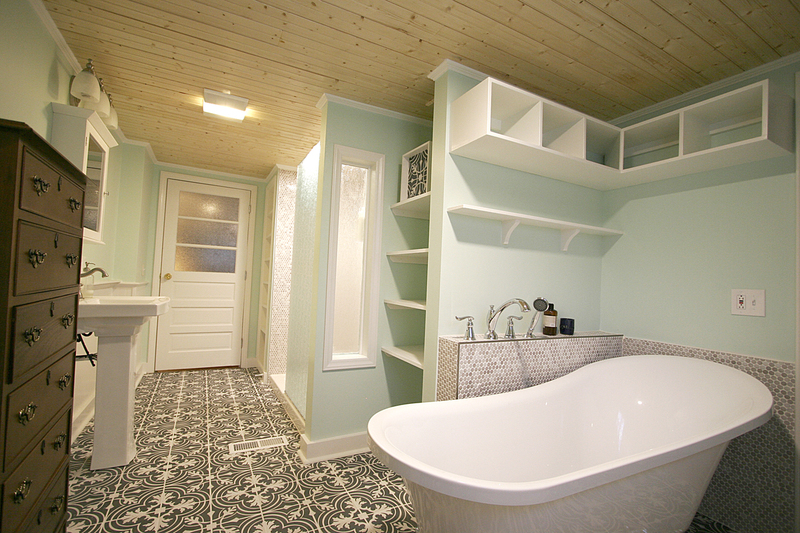 We updated the baths with 21st century style and materials while keeping the farmhouse aesthetic in the details. While the farmhouse inspired the room’s bead board chair rail, farmhouse utility inspired making its trim a continuous useable shelf throughout the room. The idea of utility came into play again in the custom moveable shelving system we created to hide the water heater while still allowing access when necessary. 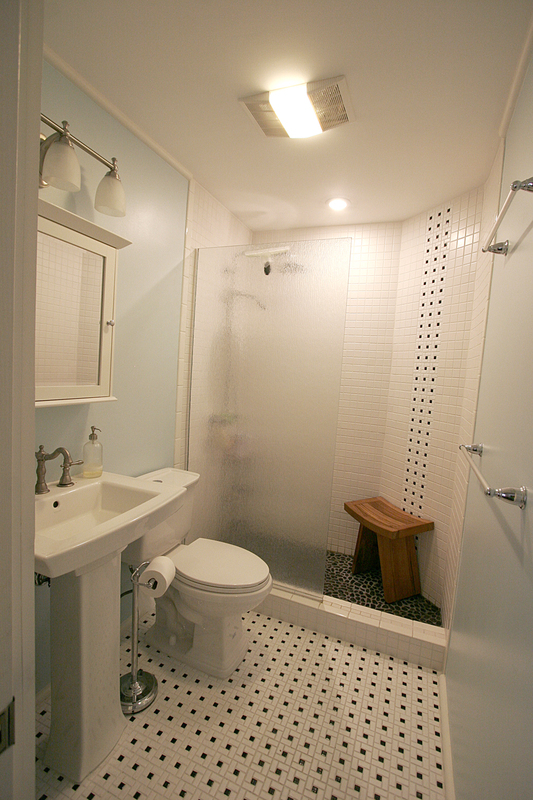 We designed a roomy shower space, tiled floor to ceiling in vintage penny tile with a Grohe rainshower system, a rain glass panel wall and a rain glass shower window to maximize the benefits of the natural light through single bathroom window. We also sourced vintage half light solid wood doors. In one, to again utilize the natural light coming from the exterior bedroom windows and the bathroom window, we created the half light by cutting out a solid door and installing satin finished glass. In the other we sourced vintage “crackle glass” film and placed it on both sides of the existing glass panels. True to the house’s heritage we also installed a claw foot soaking tub (made with modern light weight resin) and 20th C. farmhouse inspired faucets and vanity light, and a pedestal sink. 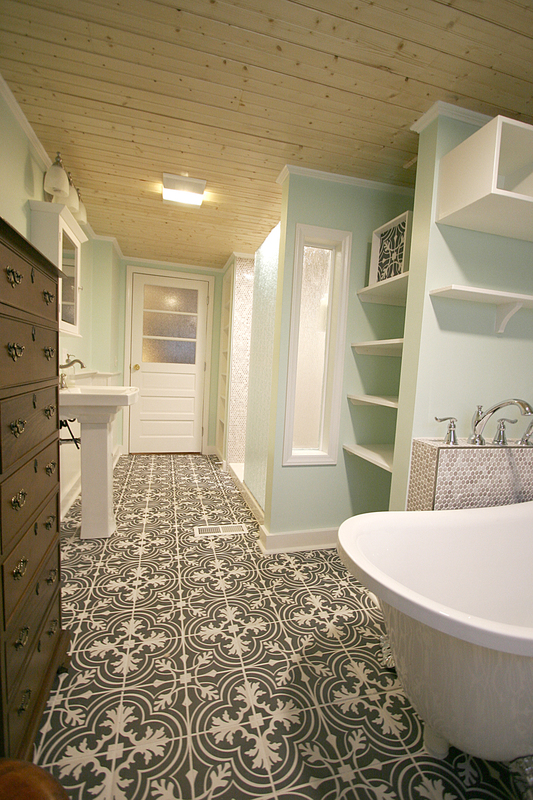 The vintage floor tile (patterned in the 1920’s) is our age-appropriate statement piece. Above the soaking tub and it’s tiled roman faucet half wall we designed built in cubbies for towels etc. and a custom shelf reachable while in the bath tub. 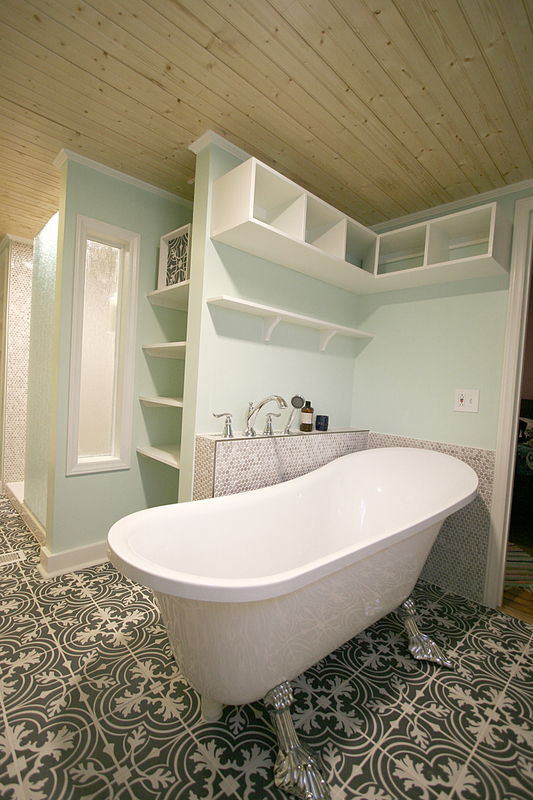 We took space from a closet on the other side of the original bath wall to fit in the soaking tub area. 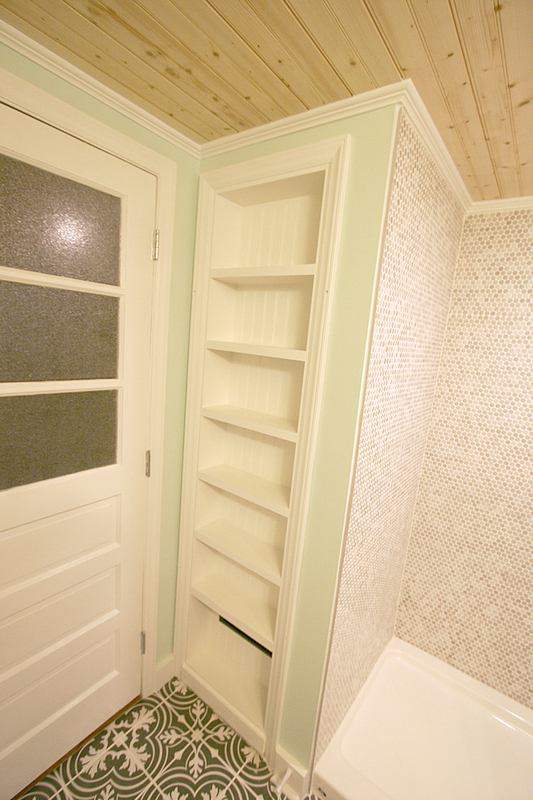 Utilizing the space to the maximum degree, we also made the space between the shower and bath tub a built-in linen closet. The #1 pine plank ceiling we installed warmed and transformed the entire space. 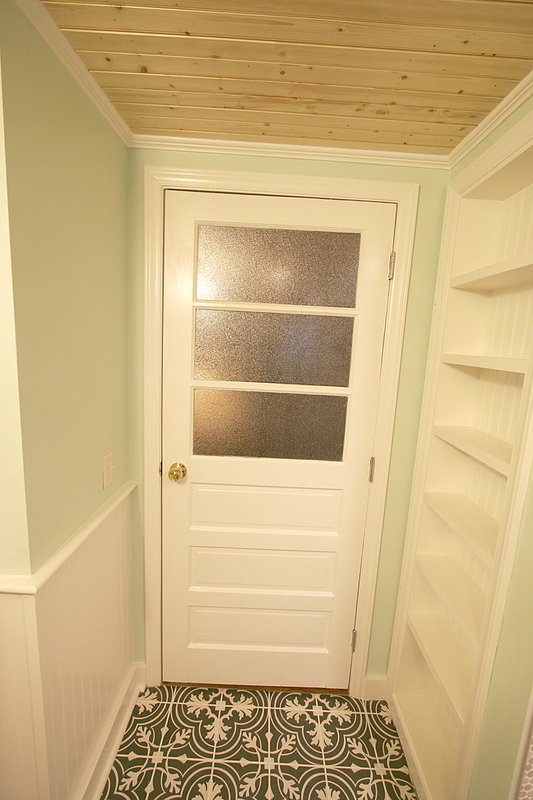 To create the space to add a bathroom in an upstairs corner, we annexed a portion of the attic, created a new doorway, and added two walls with the corner clipped at a 45 degree angle to enhance the flow of the surrounding room. 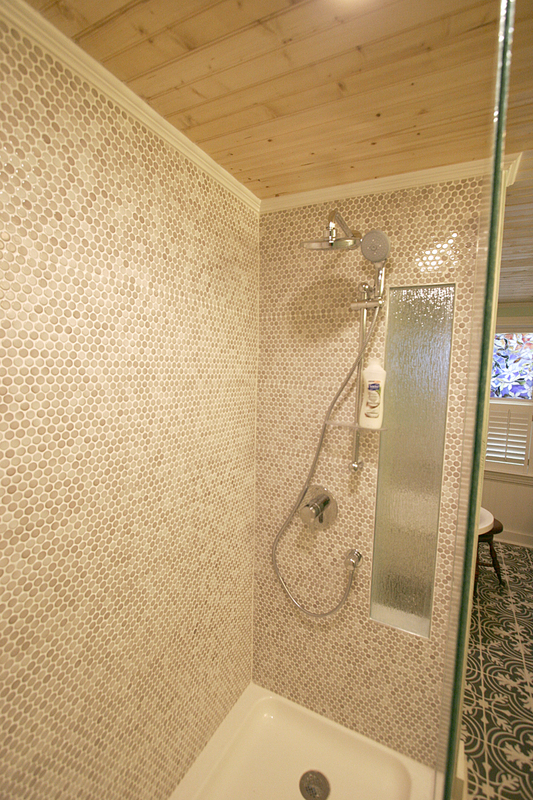 The white mosaic-tiled full size shower was placed on the wall with the 45 degree corner so that it became a shower feature that we then emphasized by accenting it with a vertical swath of the vintage floor tile. 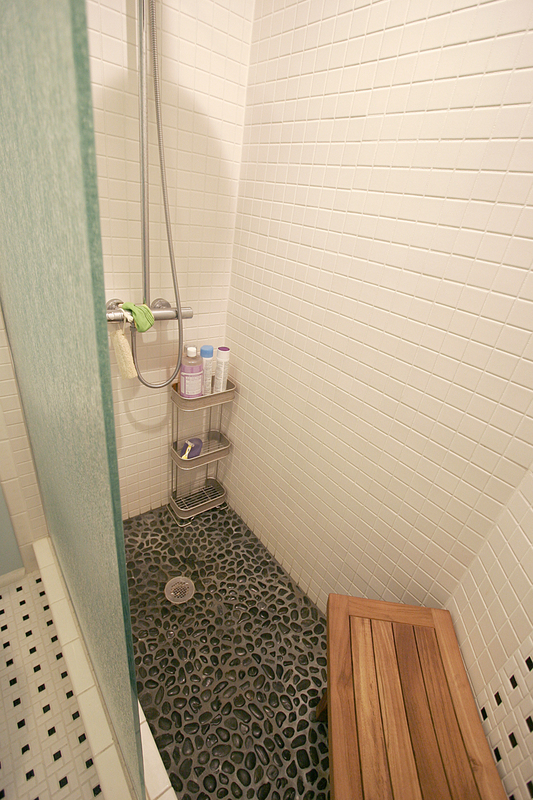 A pebble shower floor ties the black and white theme together. A farmhouse inspired faucet, vanity light and pedestal sink keep it era-appropriate while the rainglass shower panel wall and Grohe rainshower system provide modern style and functionality.